The nCounters Essential Angle Sensor gives immediate audio and visual feedback on knee, hip and elbow joint movement. We believe in our products and we know that if you try them you’ll be delighted, so we’re offering a discount on the Angle Sensor Unit until April 30, 2019. Get $100 off our normal price while stocks last! 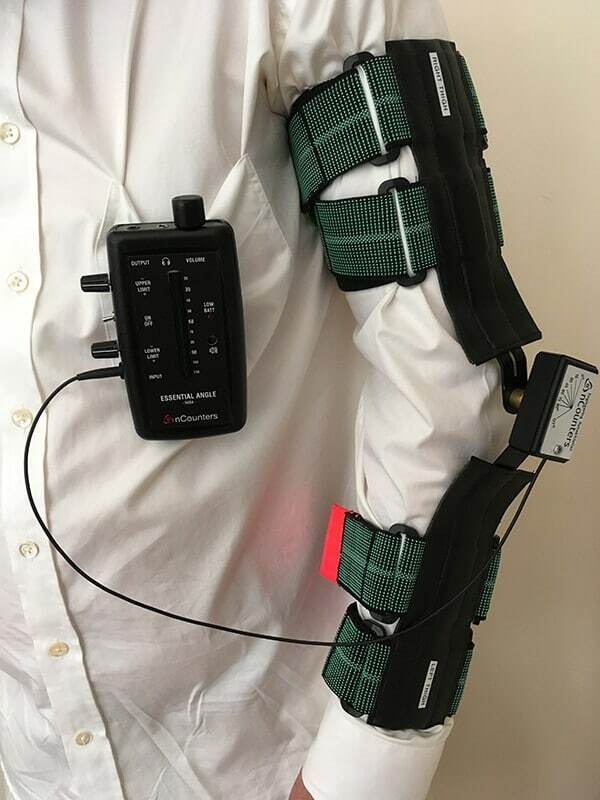 Immediate audio and visual biofeedback on joint movement motivates patients to reach treatment goals faster. This portable device is easy to set up, simple and efficient to use daily during rehabilitation. The Angle Sensor can facilitate functional training and improved joint control in various positions. The Angle Sensor maybe used to provide feedback on elbow extension (such as for reaching) and flexion. 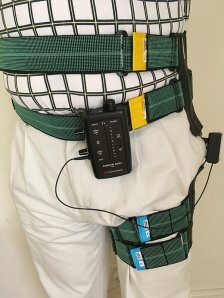 The Angle Sensor can be used to provide feedback on appropriate knee or hip flexion or extension. 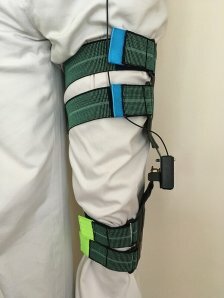 The Essential Angle Sensor can provide immediate feedback on knee hyperextension, another common problem encountered post acquired brain injury or orthopaedic surgery. The Angle Sensor is placed over the joint being trained and aligned with standard bony prominences. 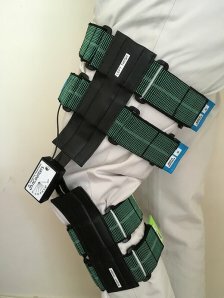 The metal stays are placed either side of the joint and secured in position by using coloured Velcro straps. The Angle Sensor is connected by a cable to a simple Control Unit. 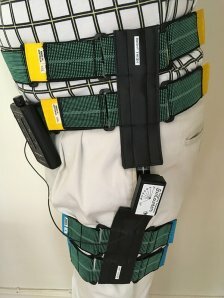 A belt clip attaches the Control Unit to the patient. 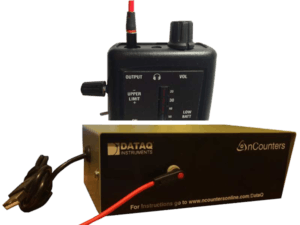 DATAQ hardware and software will accept and record data from the nCounters Essential Angle Sensor. 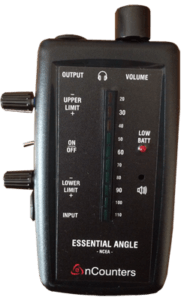 When the patient’s joint angle is between the upper and lower limit values as set on the dials at the side of the control unit, the patient will hear no sound. If the joint angle is outside these two limits then the patient will receive audio feedback via a speaker or headphone. The sound changes and increases in pitch the further away the patient gets from the target range. Real time feedback is also provided by 10 coloured LED display.